Two days after a motorcyclist was airlifted to a hospital following a crash involving a parked car carrier, the town reminded residents that if car carriers block traffic, they are violating a town ordinance. In the release sent Thursday, the town said car carriers are only allowed to load and unload vehicles in three areas, including the south parking lot at Phipps Ocean Park.. The other two locations are: the 300 block of North County Road, the west side of the street from south of the fire house to north of Atlantic Avenue in areas designated for on-street parking, and the 300 block on South Lake Drive, between Brazilian and Australian avenues, allowing both sides of traffic to flow. The town said any car carriers found blocking lanes of traffic can receive a code violation, traffic citation and face a fine. Loading cars is only allowed between 8 a.m. and 8 p.m., and violators are subject to fines. Despite the ordinances, witnesses to the accident this week said they frequently see car carriers park illegally. On Tuesday, a man in a gray Lexus was forced to stop while waiting behind a car carrier that was blocking a portion of the northbound lane at 2505 S. Ocean Blvd. 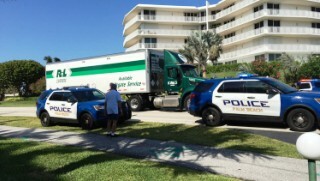 After a few southbound cars passed, the man, who declined to give his name, said he drove around the carrier truck and pulled into the entrance of The President of Palm Beach Condominium across the street. But before his car pulled all the way into the condominium parking lot, a red motorcycle driving southbound clipped the car’s rear bumper, the man said. A truck drives by the scene of Tuesday’s motorcycle crash in Palm Beach, where a man was airlifted by Trauma Hawk to a hospital. A car carrier, not pictured, was involved in the accident, according to witnesses. The motorcyclist hit the pavement and was unresponsive when officers arrived, according to Palm Beach Fire-Rescue. He was airlifted off the island by a Trauma Hawk. Palm Beach Fire-Rescue did not provide an update on the injured man Friday. The President of Palm Beach Condominium manager Monique Videla and resident Stephanie Mannino, who saw the aftermath of Tuesday’s motorcycle crash, said they routinely see car carriers illegally park on and block the road in the 2500 block of South Ocean Boulevard. Both said they thought the car carrier blocking the road on Tuesday likely played a role in the crash.